I’m sure that you have already heard some about the famous Hungarian food and you have an idea about what Hungarian goulash is as well.But do you know exactly what Hungarian goulash is, and how many variations there are? How much do you know about other original Hungarian specialities? 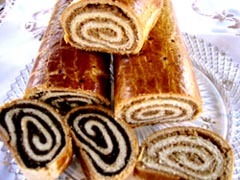 …then I would still recommend you check out these pages about Hungarian foods! I can guarantee that after reading the following pages you will be an expert on the distinctive Hungarian specialties and you will dazzle your friends and relatives with what a good cook you are! Eating good foods and enjoying excellent flavors is very important to every Hungarian, but I guess we are not alone on the planet with this behavior. I bet that you have exactly the same “feature”. I always enjoy seeing the faces of our foreign friends when we invite them to our home for an original Hungarian dinner. Their satisfied and smiling faces and the silence during dinner show that they like our cooking very much. And this is the most important to every cook. I don’t know how it is in your country, but in Hungary if there is silence at the table and you see that people are just eating and eating without talking, it means that they are very happy with the food on their plate. This is the biggest appreciation of your effort that you can ever get! If you want to feel the same happiness that we always feel when we are cooking for our friends, and you want to know more about the legendary Hungarian food, please follow me on the next pages. I will introduce you to the most famous Hungarian recipes and I will share with you my favorite recipes and how you can make them. The secret behind the international reputation of Hungarian cuisine is that nothing is set in stone. It is still being shaped by the work of famous cooks and enthusiastic housewives, who are successfully and creatively incorporating the traditions of other nationalities. What makes the Hungarian food so special is that it fundamentally deviates from European culinary traditions. The use of pig fat is unique; it is used in a fried and uncompressed form. 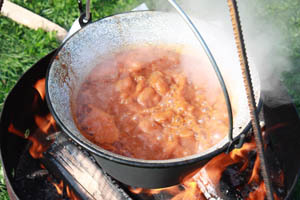 Frying onions in fat is the basis of a number of dishes, and it is complemented with fine, red paprika - this results in the highly original nature of Hungarian meat stews and goulash soups. 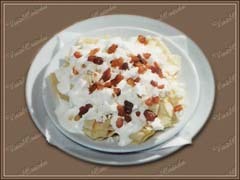 These are enriched with a dairy product little known in Europe: sour cream. The main courses are preceded by rich soups, which are prepared in unparalleled diversity from beans, cabbage, potatoes, pasta and vegetables ranging from peas to kohlrabi - this is also unusual outside Hungary. The steaming hot soups are followed by sweet pasta dishes: dumplings, streaks, and jam pockets; filled and sprinkled with fruits, poppy seeds and walnuts - yet another surprise for foreigners. 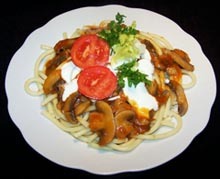 We Hungarians usually serve pasta as meatless (fasting) dishes, as opposed to the traditions of the great pasta-eating nations. 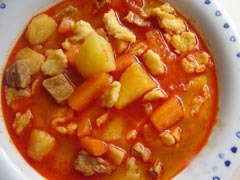 A wide range of vegetable stews are also eaten in Hungary. These are often made from vegetables - for examples, gourds - which are not even considered to be edible in some regions of the world. 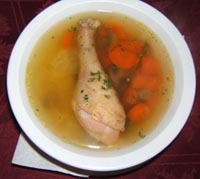 The traditional soups and vegetable stews are enriched by thickening sauces. 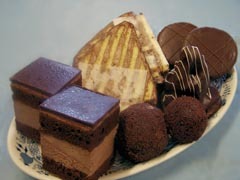 is a separate branch of Hungarian gastronomy. Although this requires great, expertise and know-how, it can result in supreme delicacies. There is a wide range of diverse casseroles which were originally kettle dishes before becoming established, Hungarian culinary staples. At the end of the 20th century, the prevailing view was that the Hungarian food is unhealthy since it is fatty and calorie rich. Now in the 21st century, people often claim that animal fat is healthier than hydrogenated margarines and oils. What should we Hungarians think about all of this? I think the answer is that a cuisine that has incorporated such a wide range of base-ingredients, culinary techniques, diverse tastes, spices, meats, vegetables, fruits, and dairy products for centuries surely cannot be unhealthy. If we manage to maintain a proper balance, Hungarian cuisine can please the most fussy stomach, taste or demand. So, after this small food history let's get started with the recipes! This is the queen of the soups. We Hungarians cannot imagine any important family event without this soup. It is quite difficult and complicated to cook it, but the final result will be worth it. If you like mushrooms, I highly recommend that you try out this soup. The preparation of this soup doesn’t take too long time and it is easy to make. BUT, one hint: be careful with the mushrooms, especially if you have collected them from the forest. Don’t cook any mushrooms that look nice, they are 100% dangerous. It is best to buy mushrooms from trusted sources, rather than picking your own. - What a heck is this goulash anyway?? 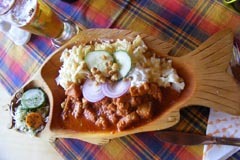 Don’t these Hungarians call everything goulash?? No, definitely not. You will see the differences soon, between goulash and goulash soup. They are totally different things; just their name is a little bit similar. This is the so called “amuse of the enemy”. As I’m writing these sentences, I’m remembering on the taste of this splendid Bean soup and I’m feeling that my stomach is playing with me and I’m getting hungry. The taste of this soup is so great that I highly recommend trying it out. If you don’t want to cook it yourself you should try it in a restaurant when you visit Hungary. You can find this original Hungarian food in almost all Hungarian restaurants. Of course the best is to follow my instructions and make it yourself. 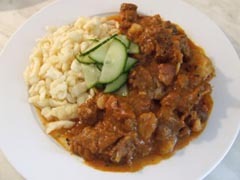 You can find various recipes for goulash here, as well as some tips and tricks for preparation and cooking of this world known Hungarian food. 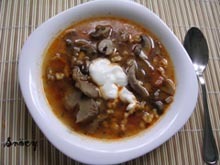 As I promised you will also see the difference between goulash and goulash soup. Don’t be afraid. We don’t eat any Gypsies. 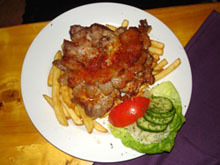 Frankly I don’t really know why this traditional Hungarian food is called Gipsy steak. I tried to find out for you, but unfortunately no success. So if we really want to know the origin of the name of this steak we have to guess. But, what I know for sure: this is a very good and tasty steak. I like it very much. If you are vegetarian, but you don’t want to miss the experience of eating Hungarian goulash, than you should try out this Mushroom stew. 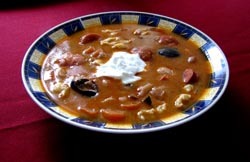 It is made similar to goulash, but of course without meat. This is a great alternative to the original goulash. Catfish is a very tasty and popular fish in Hungary. You can find this fish in almost every lake and river. It has a very nice white meat without fish bones. Catfish paprika is one of my favorites; I especially like it with Savoury curd cheese pasta. This pasta is good for beginning cooks. Very easy to make and the taste is gorgeous. The only problem that you can have is to find good smoked bacon and cottage cheese. I don’t think I need to mention that we are very good also at cake making. You can find lots of traditional and non-traditional Hungarian pastry recipes here. I will share some traditional Christmas recipes with you here. You will learn how to cook the traditional Fish soup and Hungarian cabbage rolls, and how to make Christmas cakes. 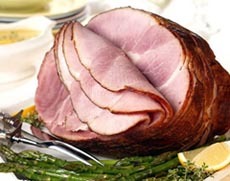 An old tradition in Hungary is that we eat stewed ham during Easter time. In this section I will show you how this ham is made. Of course I won’t forget to give you some ideas about other traditional Easter foods. You will find my favorite Hungarian foods here. Some recipes come from my wife, from my mother, and some from my grandmother. I don’t think I need to make you believe that they are the best sources if we speak about cooking. I’m updating these pages about Hungarian foods continuously. If you have any comments or request, please contact me. I’m always very happy to get your feedback. If you have any special needs, just let me know and I’ll try to meet your wishes.